Stephen King has said "...ideas seem to come quite literally from nowhere, sailing at you right out of the empty sky: two previously unrelated ideas come together and make something new under the sun. Your job isn't to find these ideas but to recognize them when they show up." Well, I was thinking of packing tape ghosts because, well, I'm a haunter. I happened upon a painting of a ghostly scarecrow with a typical pumpkin head. And I thought "Ghost Pumpkin!" 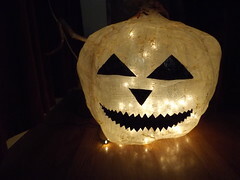 As a Jack o Lantern, the light would be in reverse - the shell would shine and the eyes, nose, and mouth would be dark. I had made a giant pumpkin head from paper mache before, so this would be no problem. 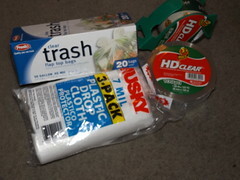 I gathered some materials - clear garbage bags, some drop cloths, a couple rolls of packing tape, and some stuffing material. Everything came to less than $20, and the 3 pack of drop cloths were completely unnecessary. I already had a strand of lights. If I were doing it again, I'd buy battery operated LEDs. 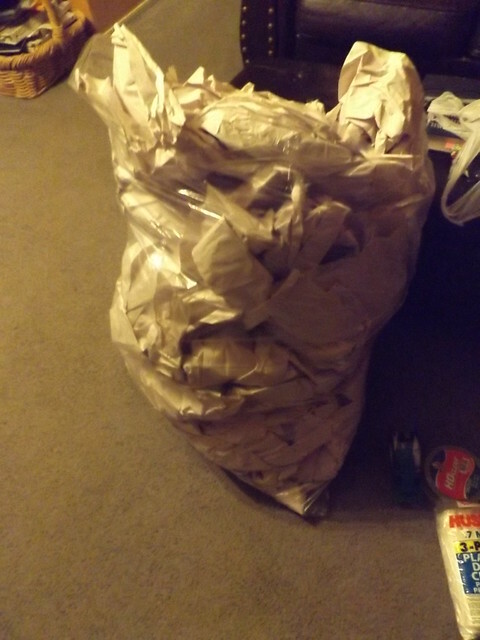 The first step was to stuff my 30 gallon trash bag with paper. It has to be stuffed enough that you can shape and mold the bag afterwards. Again, if I make another, I will probably crumple each sheet into a small wad and stuff it that way for easier removal later. 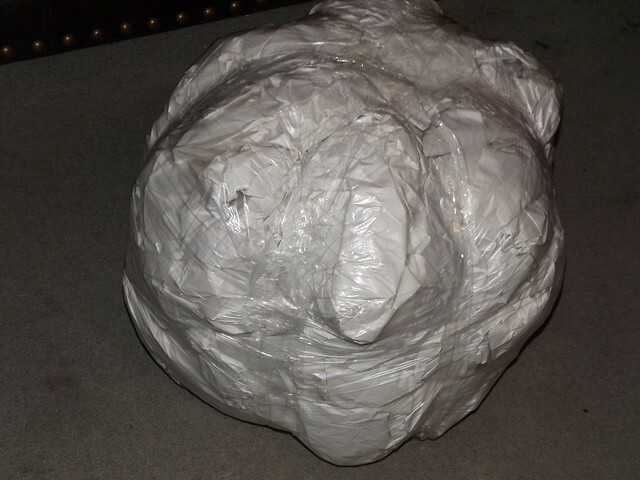 The packing tape shell is not as sturdy as paper mache. Once I had it pretty stuffed, I taped the open end shut and taped down the pointy corners as well. Now the time came to shape the thing into a recognizable pumpkin, not an apple or a piece of...ahem. So - it needs the telltale ribs of a pumpkin. For paper mache, I would use twine and tie the bag to make the ribs. Twine, however, is not transparent. Fishing line is, but I don't have any. There's a fine line between fishing and just standing on the shore like an idiot. I do not know where that line is. There is clear twine out there somewhere, I'm sure. I did not have any, and one trip to the store is enough for me. 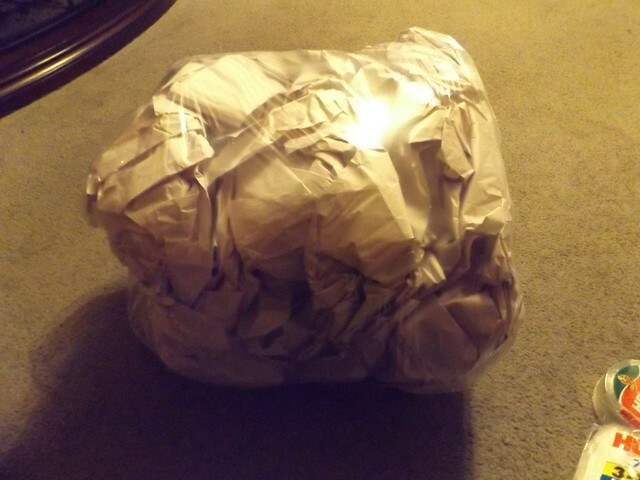 So I used the packing tape. I pulled out a length of tape that looked about long enough to stretch around the pumpkin. Then I folded about a third of of the width back on itself, sticky sides together. What I got was a long, narrow piece of tape that still had a sticky strip but was also doubled up on one side. I did this to strengthen the tape, add rigidity to the finished ribs, and to narrow the groove made by the tape. Would I do it again? yeah, if I did not have clear twine I would. Rigidity is important, so I might do it again even if I had the twine. Anyway, I did this three times to make 6 ribs. Then I did it again to really reinforce them. It needs some kind of support structure, after all. 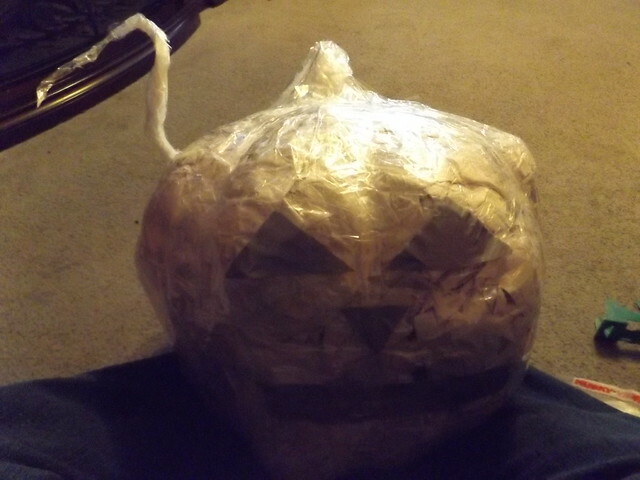 From that point, I just covered the thing with packing tape, trying to refine the "pumpkin" shape as I went. Like paper mache, I alternated between vertical and horizontal layers. 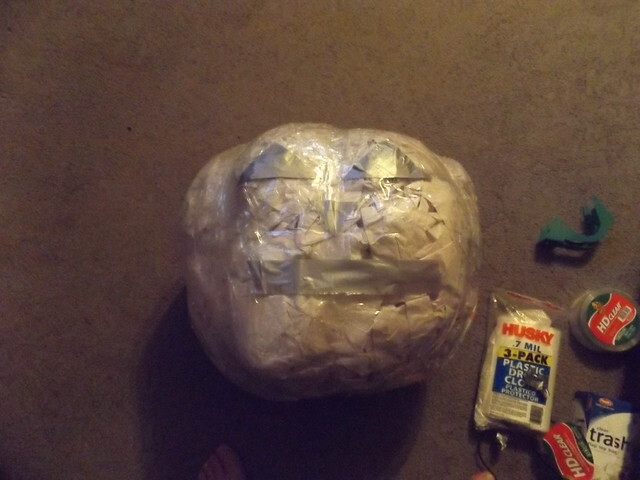 I did 3 layers of tape in this way, then I used some duct tape to block out where the features would be. This is when I started to make the stem/vine. Now, If I were doing this again, this is where those battery powered LEDs would come in handy. Of course, any string of lights would work. What would I do? I'll tell you. I'd cut a slit in the top and slide the lights inside at this point. I'd leave enough sticking out to run them the length of the vine. Then I'd incorporate them into the vine as i made it. Oh, well. 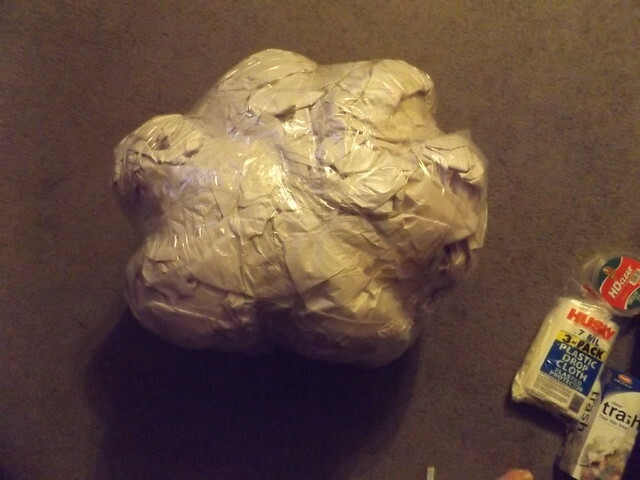 I still have packing tape, bags, and stuffing. What I actually did is I I grabbed another garbage bag and twisted it so I had a bunch of plastic about 3 feet long, thinner at one end and fatter at the other. 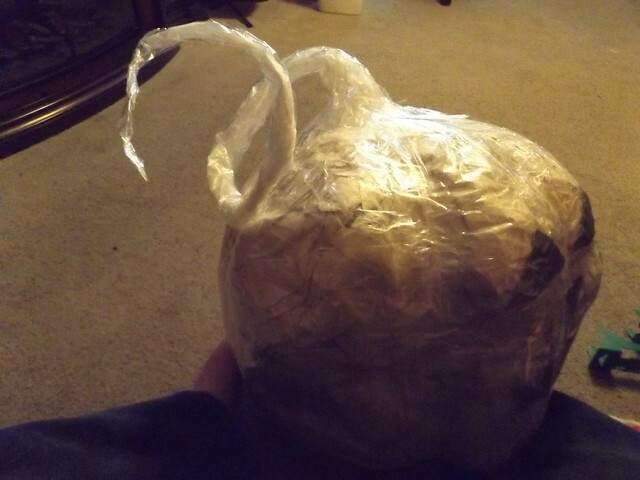 Then I taped the fat end to the pumpkin and wrapped the whole thing with a couple layers of tape, bending it along the way to help it keep a twisted vine shape. Don't tell anyone, but I also taped a piece of the vine right to the body to help keep that shape. Plus, I thought it might make an interesting mask, and I did not want the vine flying loose in that situation. That's already probably more info than you need to make your own ghost Jack o Lantern. It's all I have time to write today.